At the invitation of President of the Republic of Turkey Recep Tayyip Erdogan, Minister of Culture and Tourism Luo Shugang, as President Xi Jinping's Special Envoy, will travel to Turkey to attend the inauguration ceremony of President Erdogan on July 9. As agreed by China and the European Union, Premier Li Keqiang will co-host the 20th China-EU Summit with Donald Tusk, President of the European Council and Jean-Claude Juncker, President of the European Commission in Beijing on July 16. Q: Do you have any updates to share with us on the rescue efforts after boats capsized off Thailand's Phuket island? What has been done by the Chinese side for the follow-up matters? A: This accident in Thailand's Phuket island has been on the minds of all Chinese people. I have some latest updates here on the rescue efforts and other follow-up work since the accident happened. After cross-checking with various parties, we know that there were 127 Chinese people in total, with 122 of them boarding the two boats and five others never getting on the boats. Of the 122 passengers aboard, 75 were rescued, 41 lost their lives, and six were still missing. The Chinese rescue team is cooperating with the Thai side. Our two sides are sparing no efforts in the search and rescue work. We have asked the Thai side to expand their searching area under the sea and mobilize all resources to increase search frequency. The Thai side made it clear that their search efforts will not cease until every missing Chinese tourist is found. A joint working group comprised of China's diplomatic missions in Thailand, the Foreign Ministry, the Ministry of Culture and Tourism and the Ministry of Transport has been working with the Thai side, offering assistance to the Chinese tourists involved and their family members and staying in close communication with the Thai side on the preservation and identification of the bodies. Now, three family liaison centers and one reception center have been set up by the Thai side on the Phuket island to help settle follow-up matters for the bereaved families, including offering transport, accommodation and food and providing one-on-one services. On July 8, Thai Prime Minister Prayuth Chan-ocha expressed his deep condolences to the victims and sincere sympathy to the bereaved families and the injured in signed letters to Chinese President Xi Jinping and Premier Li Keqiang. On the same day, Thai Foreign Minister Don Pramudwinai also sent a message of condolences to State Councilor and Foreign Minister Wang Yi. Thai Prime Minister Prayuth said that the Thai government and relevant departments attach high importance to this accident and have been offering emergency assistance and proper arrangements for the affected people. The Thai side immediately set up a command center for search and rescue to organize relevant work, and a thorough investigation into the accident is also underway. The Thai side will do its utmost in searching for the missing people and supporting those affected by this accident and their family members. The Thai government is determined to prevent a recurrence of such a tragedy. There are now Chinese diplomatic staff stationed in the airports and hospitals to assist these Chinese tourists and their family members. Besides the emergency hotlines of the Chinese Embassy in Thailand (0066-642351752,0066-820367651) we already published, the consular office in Phuket of the Chinese Consulate-General in Songkhla also opened up a green passage for 24-hour document service, and their hotline is 0945956158 (please dial 0066-945956158 if the call is made from China). The Foreign Ministry, China's diplomatic missions in Thailand and the joint working group of the Chinese government will strictly follow the important instructions from President Xi Jinping and other leaders of the Party and the state. We will remain in close communication and coordination with the Thai side and ask for their best efforts in locating the missing, treating the injured, finding out the cause of the accident, and making proper arrangements for follow-up matters so as to ensure and protect the legitimate rights and interests of the Chinese citizens. Q: Could you talk a bit more about the upcoming 20th China-EU Summit? What is China's expectation for this summit? A: The China-EU Summit, as a dialogue mechanism between the Chinese and the EU leaders at the highest level, has been playing an important role in guiding the development of China-EU relations. Premier Li Keqiang will co-host the 20th China-EU Summit with President Donald Tusk of the European Council and President Jean-Claude Juncker of the European Commission in Beijing on July 16. President Xi Jinping will meet with President Tusk and President Juncker. The leaders of the two sides will chart the course for the further progress of China-EU ties and exchange views on issues of mutual interest and major international agenda items. China-EU relations are now growing with a sound momentum. Dialogue and cooperation between the two sides on all fronts have been strengthening and expanding. This year, as China and the EU celebrate the 15th anniversary of the comprehensive strategic partnership and the 20th anniversary of the China-EU Summit mechanism, the two sides look forward to reaping fruitful outcomes from this summit, steadily advancing China-EU ties, and making joint efforts to safeguarding multilateralism, promoting trade and investment liberalization and facilitation, addressing global challenges, and upholding world peace, stability and development amid the complex and volatile international landscape. Q: Firstly, last week the DPRK and the US held the high-level meeting in Pyongyang. After US Secretary of State Mike Pompeo left Pyongyang, the DPRK state media issued hard-line comments, criticizing the attitude and position of the US side. Quite a few US political figures believe that the change in the DPRK's position has something to do with China. US Senator Lindsey Graham said there is no doubt that it is China pulling the DPRK back to the hard-line position. What is your response to this? Secondly, last Saturday, two US destroyers sailed through the Taiwan Strait. What is your comment on it in light of the current state of China-US ties and cross-Strait relations? A: With regard to your first question, we have also noted that after Secretary of State Mike Pompeo's visit to the DPRK, there seems to be some differences between the statements made by the two sides. 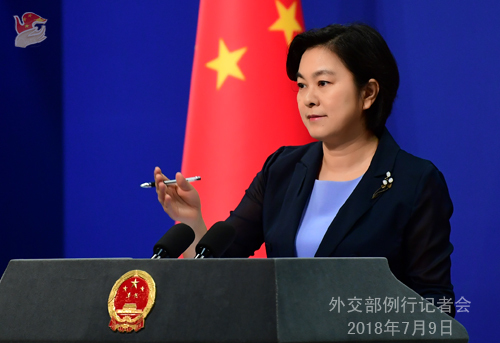 The Chinese side has been stressing that we hope that the DPRK and the US can strengthen dialogue and consultation, follow through on the consensus and outcomes of the summit in Singapore and move forward the denuclearization of the Korean Peninsula and political settlement process of the Korean Peninsula issue in the right direction and strive to achieve steady progress in this aspect. Just now you said that some people in the US associated the inconsistency of the statements made by the DPRK and the US after their high-level meeting with China's role in the Korean Peninsula issue. I believe that it does not make any sense. China's attitude on this issue is consistent and clear-cut. We will continue to play a positive role in and make constructive contributions to realizing the denuclearization of the Peninsula and achieving the long-lasting peace and stability of the region. Regarding your second question, China has closely followed and knows fully well the whole process of the US warships' sailing through the Taiwan Strait. We have expressed our concerns to the US side on this. It must be pointed out that the Taiwan question bears on China's sovereignty and territorial integrity and it is the most important and sensitive issue in China-US relations. We urge the US side to earnestly abide by the one-China principle and the stipulations in the three China-US joint communiqués and prudently and properly handle the Taiwan-related issues, lest it should undermine China-US ties and the peace and stability across the Taiwan Strait. Q: New Zealand last week issued a "strategic defense policy statement" that was critical of China in its actions in South China Sea. Today, the New Zealand government announced that it would buy four submarine-hunting P-8A aircraft. What is China's view on this? Does this represent a shift by New Zealand in its position towards China? A: We have noted the China-related content in the relevant document issued by New Zealand. We have lodged stern representations with New Zealand on the wrong remarks it has made on China. It must be pointed out that the socialism with Chinese characteristics represents the choice made by the Chinese people as well as the history. We will unswervingly follow this path. China is always a builder of world peace, a contributor to global development and a champion of the international order. China's development poses no threat to others. Instead, it will provide other countries around the globe with important opportunities. As to the South China Sea issue, our position is consistent and clear-cut. China's constructions in its own territory by the South China Sea are completely justified and legitimate. Nobody is in the position to make irresponsible remarks on that. 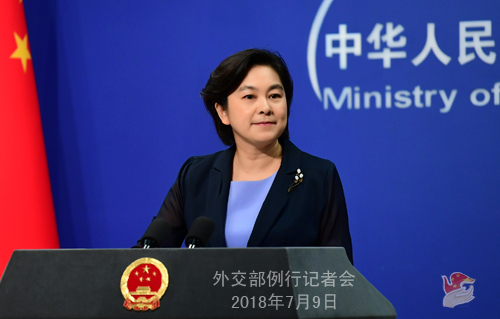 While firmly safeguarding its territorial sovereignty and maritime rights and interests in the South China Sea, China is committed to peacefully resolving the disputes through talks and negotiation with the countries directly concerned. We urge New Zealand to view the relevant issue in an objective way, correct its wrong words and deeds and contribute more to the mutual trust and cooperation between our two countries. Q: It is reported that leaders of Ethiopia and Eritrea met on July 8, during which they agreed to normalize their bilateral ties, open embassies, resume the services of the airlines, get the ports working and allow the flow of personnel. The reports said that the two countries will end years of cold war. What is your comment? A: Both Ethiopia and Eritrea are China's friendly partners. The Chinese side always hopes that the two countries can properly resolve the relevant dispute through dialogue and negotiation and normalize their relations. We commend and welcome the latest progress in Ethiopia-Eritrea relations. We are willing to join hands with the international community to continue to play a constructive role in promoting the peace, stability and development of the Horn of Africa. Q: On July 6, the Foreign Ministers' Meeting on the Iranian nuclear issue was held in Vienna. What is China's comment on this meeting? What role does China play at the meeting? A: This Foreign Ministers' Meeting on the Iranian nuclear issue was the first foreign ministers' meeting after the US withdrawal from the Joint Comprehensive Plan of Action (JCPOA). Currently, the JCPOA is at a critical juncture about where to go. The convening of this meeting demonstrates all relevant parties' support to the JCPOA. The meeting issued the foreign ministers' joint statement as its outcome, which sent out positive political signal. The Iranian side continues to stay in the JCPOA and other parties show their clear-cut will to uphold the JCPOA, which represents the most important political outcome of this meeting. All relevant parties also agreed to take coordinated actions to straighten out the implementation mechanism of the JCPOA and advance the specific projects stipulated by the agreement. The UK agreed to take over as the co-chair of the joint working group on the redesigning and reconstruction of the Arak heavy-water reactor after the US pullout. All relevant parties welcomed that and reached consensus on standing together against the unilateral sanctions that violate the international rules. State Councilor and Foreign Minister Wang Yi attended the meeting, during which he had an in-depth exchange of views with the foreign ministers of the major relevant parties and promoted the conclusion of the joint statement. Confronted with the complex and grave situations, China put forth five propositions in a clear-cut manner. We emphasized in particular that the international rules should be followed and the major countries should have credibility and assume their due responsibilities. The unilateral sanctions should be abandoned because they are counterproductive. All relevant parties should stay committed to dialogue and negotiation and adopt a constructive attitude to discuss the issues of common concern. All relevant parties spoke highly of China's responsible and constructive attitude, including its leading role in facilitating the steady progress of the project on the redesigning and reconstruction of the Arak heavy-water reactor. Upholding and implementing the JCPOA remains an arduous task. The Chinese side will continue with its efforts to uphold the outcome of multilateralism. China will by no means accept the unilateral sanctions which are groundless under the international law and we will resolutely safeguard our own legitimate rights and interests. Q: It is reported that China has ended its ban on importing salmon from some regions of Norway on Tuesday last week. Could you confirm if that is correct and why it happened now? A: I would like to refer you to the Commerce Ministry or the customs department for this question. Q: Firstly, regarding the rescue operation in Thailand, does China have any specific request in terms of expanding the research? Are you asking a timetable to try to find all the missing people? Secondly, as to the Taiwan Straits mission by the US Navy, does China see any relation between this action and the current tension over trade tariffs? A: Regarding your first question, just now I have briefed you on the relevant information. A joint working group comprised of China's Foreign Ministry, the Ministry of Culture and Tourism and the Ministry of Transport has been staying in close communication with the Thai side. We have asked the Thai side to expand their searching area under the sea and mobilize all resources to increase search frequency. The Thai side made it clear that their search efforts will not cease until every missing Chinese tourist is found. With regard to your second question, I have made clear China's position just now. I can give you a principled response. The sound and steady development of China-US relations, the proper handling of differences in the spirit of mutual respect and the expansion of cooperation under the principle of mutual benefit serve the common interests of our two countries and represent the shared aspirations of the international community. We hope that the US side can respect China's core interests and major concerns and meet the Chinese side halfway. Q: India last week announced it was cutting import tariffs on as many as 3000 items from China and several other Asian countries. I was wondering if you have any comment on it? Also, in light of the trade dispute with the US, does China plan to announce further tariffs reduction to boost trade with other countries in Asia? A: You may have all noticed that the outcome document of the fourth round of negotiations on tariffs reduction under the Asia Pacific Trade Agreement (APTA) took effect on July 1. Six members of the Agreement, namely China, India, the ROK, Sri Lanka, Bangladesh and Laos, agreed to cut tariffs on a total of 10,312 items with an average margin of preference of 33%. What you mentioned about the tariffs reduction by the Indian side, to my understanding, is part of the implementation of the APTA outcome documents. The Customs Tariff Commission of the State Council has announced that in order to advance the Belt and Road Initiative and promote free trade areas, China will impose agreement tariffs on imports originated from 26 countries or regions. It is known to us all that at this year's Boao Forum, China announced a series of measures to seek further opening-up. We have taken the initiative to expand imports, reduced the import tariffs by a large margin for cars, parts and components and daily necessities, and adopted zero tariff for anti-cancer drugs. These positive measures taken on the grounds of our own development needs have been well received by the relevant countries. China will continue with its opening up at a pace set by itself in accordance with its goals and development needs. We believe that greater imports and tariffs reduction by China will bring enormous market opportunities for regional countries including India and the whole world. Follow-up: Will China cut tariffs on anti-cancer drugs from India? A: A very popular film called Dying to Survive that is on show these days touches on the issue of anti-cancer drugs from India. China and India are witnessing a growth in pharmaceutical trade, and the two sides are in sound communication on opening the Chinese market to drugs from India and conducting dialogue and cooperation between the two sides' pharmaceutical industries. The relevant departments have formulated specific measures on promoting China-India pharmaceutical trade cooperation and granting greater access to drugs from India. We believe that stronger pharmaceutical trade cooperation will contribute to the wellbeing of the people in our two countries.